Asahi Optical Co., Ltd. is pleased to announce the introduction of the SMC Pentax-FA Zoom 24mm~90mm F3.5~F4.5 AL [IF] lens for use with the Pentax MZ series of autofocus 35mm SLR cameras. This versatile 3.75-times zoom lens covers the most frequently used focal lengths (from 24mm wide angle to 90mm medium telephoto) and offers a minimum focusing distance of 0.5 meters (1.65 ft.) at any focal length for a maximum magnification of 0.18 times at the 90mm telephoto end. Thanks to the incorporation of two aspherical lens (AL) elements and anomalous low-dispersion glass element, it offers a high-contrast, high-resolution image reproduction over its entire zoom range. It also features the acclaimed inner-focus (IF) mechanism and ghostless lens coating to offer a bright, true-to-life image throughout the image field "even at the edges" even when the picture is taken with a wide-angle setting at a close distance and against backlight. In addition, it comes equipped with a flower-shaped oval lens hood, which not only effectively shields the lens from excessive light, but also allows the photographer to attach and remove the lens cap and adjust the polarizing filter through a window without having to remove the lens hood. 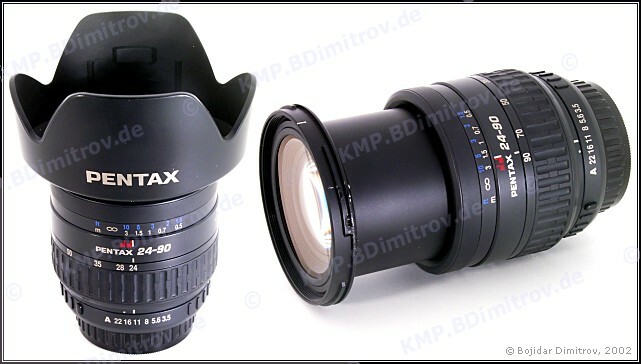 This high-performance autofocus zoom lens is recommended as a standard lens for Pentax MZ-series SLR cameras to capture high-quality images in a wide variety of applications.